Task: To modernise its production facilities and find an effective alternative to the die sinking process it had been using to produce cutting dies, punches, punch holders and other tools. Solution: To invest in its technical skills, qualified professionals, equipment and new technologies. As part of this Tecnimol purchased a ROBOCUT wire EDM “to guarantee the quality, speed and absolute accuracy of its work”. Result: Quality and cycle times have improved at Tecnimol. The company sees additional benefits in “speed and the fact that it is easy to use”. It is also a reliable machine and basic functions can be learnt in just a few days. Founded in November 1984, Tecnimol specialises in high quality and precision tool manufacturing and mass production of parts for the metal industry. In 1999 it expanded its product range to progressive tools, dies and cutting. This new focus increased the productivity and led to building new facilities, providing better work conditions, organization and techniques, increasing the scope for innovation, quality improvement and production speed. Today, after obtaining the Quality Certification in 2002, it keeps striving for excellence. In 2010, new facilities and production equipment were purchased to satisfy its customers' demand for larger tools. In recent years, Tecnimol has been developing and improving its technical skills, investing in qualified professionals, equipment and new technologies. What does FANUC's ROBOCUT offer you? We manufacture cutting dies and punches, punch holders, etc. Anything that can be made using wire erosion in tools manufacturing. Before having ROBOCUT, how did you manufacture your products? Before wire erosion, we used die sinking. Why did you buy a ROBOCUT? To keep up with the latest technology in a quick and effective way. FANUC gave us the confidence we needed in our work. What are the benefits of using this machine? It guarantees the quality, speed and absolute accuracy of our work. Has your work improved since you started using FANUC's ROBOCUT? How long does it take to train a worker to use this machine? To learn how to use the basic functionalities, just a few days are enough. As the machine has multiple options and functions, to learn them all requires more time and will also depend on the worker's level of experience. What are the benefits of using this particular machine compared to other similar machines? I would say its speed and the fact that it is easy to use. It's a reliable machine and we know it can give us exactly what we need. What do you think of the automatic threading? It's a good and effective system. Its speed and reliability are great. 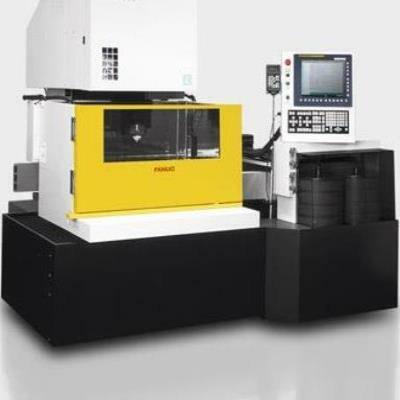 What do you think of FANUC ROBOCUT's hardware and cutting technology? It's easy to use and effective. It has multiple options that make it versatile and easy to adapt to specific needs. Do you think it's easy to use and program? Was buying a FANUC ROBOCUT a good investment? Would you buy a FANUC ROBOCUT again?